Calm Yourself. Life is Easier. You want straightforward strategies to help you sustain peaceful, predictable productivity. You want ideas and support to help you stay consciously and calmly focused. You want all 20 of the Get a Plan! Guide® publications PLUS 17 available recordings – and you want to access them easily and without a lot of muss and fuss! The whole Get a Plan! Guide® Kit and Kaboodle is for you! With this special Kit and Kaboodle offer, you don’t have to pick and choose – you get all 20 publications and the 17 available recordings for the guides listed below! Instantly receive nineteen publications and seventeen recordings. When you purchase the Get a Plan! Guide® Kit and Kaboodle, you will have ideas and inspiration to use immediately – and you’ll start seeing improvements tomorrow! Do you ever suffer through unproductive meetings? Have you ever gotten distracted at work? Is clutter costing you time, energy, and attention? Would you like to get your writing done more easily and with less procrastination? Are you spending longer on email everyday than you can afford to spend? Good news! The Get a Plan! Guide® publications offered here will help solve these problems – as well as an array of other issues that may plague you on a regular basis! You want to get the whole set of these Guides PLUS the recordings where available, which is exactly what you’ll receive when you buy the whole Get a Plan! Guide® Kit and Kaboodle! YES! The whole “kit and kaboodle” is now available in one convenient location for easy access and ready for your focused reading, listening, and implementing. And, to make it even easier, I’m offering all of the plans below AT ONE LOW PRICE! 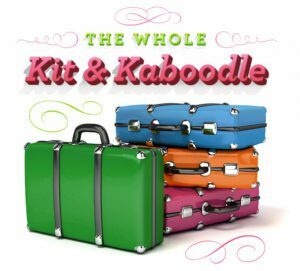 Special “Kit & Kaboodle” Price: $157. Save over 60% off the price of buying each available Guide and recording separately ($410+). Learn 10 codes to apply to your list of oh-my-gosh-how-can-I-get-everything-done-because-I’m-freaking-out items. Access this special guide to help you reach an inner calm so you can find and shape calm surroundings. Distractions are costing you time, energy, and attention. Learn how you can prevent and minimize the effects of most distractions in this Guide. Learn a dozen specific ways to deal deliberately with your clutter – and then experience a reduction in your stress. By accessing the Get a Plan! Guide® to Decisions, Decisions… Decide Once and Make Life Easier, you will have ways to take stock of your distractions and will learn 6 means to eliminate – or at the very least, minimize – those distractions. I promise that you will have a plan that you can implement starting today. Regardless of the professional role you may be in (or to which you may aspire), you can deliberately design your professional presence. In this new Get a Plan Guide® to Designing Your Productive Environment you will learn ways to design your environment, yes design your workspace for peaceful and predictable productivity. Wow! What a concept! By accessing this special guide you will give yourself the breathing room you need to reduce the stress and add gentle, calm, and easy back into your professional as well as personal life with the simple acronym. When your focus is on too many targets, including too many projects, people, crises, places, goals, then your energy is scattered and diffused. The result is exhaustion, overwhelm, and despondency. Think of how much better you feel when you are focused. This special Get a Plan Guide® helps you learn ways to limit your focus so you can be more peacefully and predictably productive. Being a faculty member involves an intense, unrelenting pace. Yet, it can be an immensely rewarding and satisfying life, which was your idea when you chose to be a professor! Let me reveal the strategies you need to get and STAY organized as you move through the semester! The sheer number of choices you encounter every day is overwhelming. The Get a Plan! Guide® to Keeping Life a Little Simpler and a Little Easier introduces the concept of how to make a few simple choices that prevent a host of other more difficult and exhausting ones. Years ago, it wasn’t necessary to know how to network because you knew who you knew – and that was all you needed to know. Today… that is far from true. Access the new Get a Plan! Guide® to Plan to Write and discover the strategies to organize and sustain a joyful academic life of peaceful, predictable productivity. If you have ever procrastinated on your writing, then access this guide to learn more than a dozen ways to get your writing done (instead of procrastinating). If your workspace is filled with clutter, you are not as free to think, create, and generate those ideas that will have the most significant impact. You can dramatically increase your sense of control over your email. Put these practices into place and see the difference in your personal and professional life. Gain practical strategies for protecting your precious resources. Keep time thieves, energy robbers, and attention burglars away! As a society, we cannot afford to be losing productivity to meetings that are poorly designed, unnecessary, or to whom the wrong people have been invited. The harder you try to control everything (e.v.e.r.y.t.h.i.n.g.) the harder life is. You want life to be a little easier, right? This guide will help you get started. Nearly every idea can be put into practice immediately, which is what I want you to do!! There are nearly 70 ideas included and each one is explained in realistic, here’s-what-to-do terms. And as always, if you have any questions, just contact Meggin. I am still reporting success. Thank you. I think we never know how we touch people. All we can do is plant the seed. I feel much more organized in control of what I carry around with me every day. And this is a huge thing. I would definitely recommend the GAP Guides. They are practical and accessible. If a person reads one of them in hopes of increasing productivity and says, “Nope, nothing useful here,” them I’m pretty sure that person doesn’t actually WANT to be more productive!